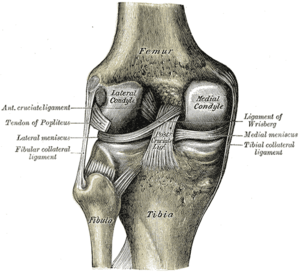 Knee injuries and knee pain are very common, however, knee pain is not always caused by a problem with the knee. What I usually tell my patients is that the knee works like a hinge; it takes on the stress from above and below. The root cause of many non-traumatic, chronic, recurrent or gradual onset of knee pain actually comes from below the knee (ankle/foot) or above the knee (pelvic/hip or higher). Below the knee: Overpronation of the foot during gait increases stress in the inner knee with repetitive movement such as running or simply daily walking over time. That’s why having good running shoes and general supportive foot wear, or orthotics, are so important. However, if you have severe pronation, you should also consider having supportive footwear inside the home as well. Most people who have flat feet usually have overpronation of the feet as well, but not everyone does. The best thing is to get your feet checked. If you have overpronation and orthopedic tests reveal that the root cause of the knee pain is originated from the feet, orthotics are usually recommended along with therapy. Study shows that foot orthoses with stretching/strengthening exercises for eight weeks significantly reduces knee pain during running and stair walking than a control group who only did the exercises. [i] This is an important take home point. While your orthotics serve to minimize stress in the knee from overpronation of the foot, you still want to make sure that the supporting muscles for your knee are balanced and functionally strong. How do I know if my muscles are strong and balanced? Simple, your health practitioner can do simple functional muscle testing for you. Above the knee: Rotation of the pelvis can also cause muscle imbalance in the IT band as well as quadriceps muscles. This may lead the muscles pulling on the knee cap excessively toward the outer aspect of the knee, resulting in runner’s knee (or cyclist’s knee). When the knee cap (patella) tracts improperly, the knee cap grinds excessively against the knee joint and also results in weakening of the inner knee muscle (distal fibre of the vastus medialis). However, rotation of the pelvis may also be a compensation of the upper body as well. If your right shoulder is rotated forward, your left pelvis will rotate forward to counterbalance or compensate for your posture in order to reduce stress and strain. That’s how our body reacts and compensates to minimize pain and other symptoms. That’s why we emphasis full body posture assessment in our clinic. Postural exercises such as yoga or those prescribed by your health professionals are highly recommended. The more you do them, the more likely your posture will improve and STAY improved. Can I take any supplement for my knee pain? How about glucosamin? Nutritional support is obviously important. Studies show that glucosamine helps with some knee pain. However, if the cause of the knee pain is due to overpronation of the feet or pelvis rotation or muscle imbalance, it will only mask the symptoms. If your knee pain is chronic, you may consider using glucosamine to protect the knee cartilage from further damage whilst addressing the mechanical issues simultaneously. Even if the glucosamine alone reduces your knee pain, it won’t stop the damaging effect from the daily faulty biomechanical stress. Other cause of knee pain: overweight or inflammatory conditions such as rheumatoid arthritis. If these are the cause of your knee pain, you are likely to experience early degeneration in other joints such as lower back or ankles. Weight loss progress with healthy eating habits would be beneficial. Omega-3[ii] as well as cumerric BCM-95[iii] can help to reduce inflammation as well. If you decide to seek professional help for your knee pain, make sure that your feet, pelvis and posture are all addressed. treatment of patellofemoral pain syndrome. Phys Ther 1993;73(2):62-68. This entry was posted in Musculoskeletal and tagged cyclist's knee, Iliotibial tract, Injury, Knee, Knee pain, orthotics, Pain, Patella, posture, pronation, runner's knee. Bookmark the permalink.